Living Better Health Retreats – Unfold Your Inner Calm. Its the same every year, always set out with good intentions over the Festive Season and never quiet manage to pull it off ! Life is about balance, relaxing and sometimes over indulging. This day’s Retreat is to give you a ‘kick-start’ back into your healthy resume. A magical retreat taking place on the outskirts of the beautiful city of Bath running from 10am – 4pm. This Retreat is very different from our Detox Day Retreat, where the focus is much more on Relaxing, Slowing Down and Rebooting . During our retreats you will experience the calm and peacefulness that is much needed in our fast pace lives. Throughout the day we will take you through the process of Yoga, Meditation, Mindfullness, Life Coaching and Nutrition. 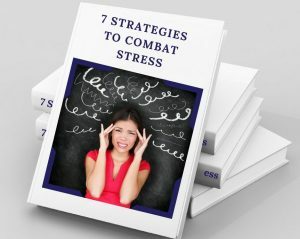 This will enable you to see its benefits and allow you to take home many tools to implement this into your daily lifestyle. Our experienced Yoga teacher is Alice Milner from Yama Yoga Hub & Funky Monkey Studio, will help you to improve your practice and flow or if you are just starting out, you will leave the retreat with the basics needed to continue with your own personal yoga journey. Lisa Barnes will show you how to encorporate a sense of peace and calm into our modern life style. As an experienced Coach & Energy worker, she will demonstrate how to have a successful meditation practice and explore the possibility to a new way of viewing your stresses and limiting beliefs. Along with her knowledge in nutrition and superfoods, Lisa ensures the juicing recipes are nutritionally balalnced to keep you going the whole day, without feeling hungry. The essence of the day, is to create some ‘me’ time, nurture yourself, and be around like minded people, whilst cleansing your mind, body and spirit. The aim of the day is to guide you through any new modalities, no matter what level or experience you have, so even if you attend a yoga class regularly this course is still for you. Technique & guidance is always important in Yoga and small alterations you can help to improve your practice. however that fits into your lifestyle. 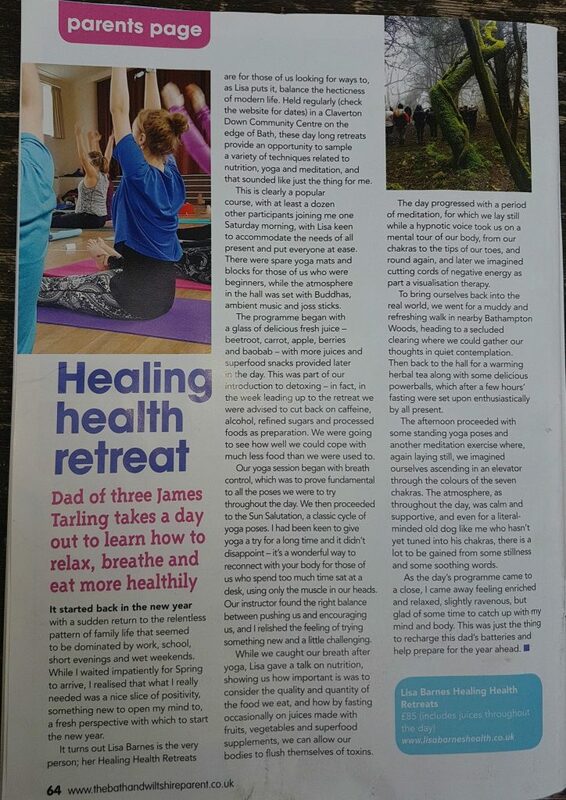 At one of our retreats, we were lucky enough to have someone come along from the Bath & Wiltshire Parent Magazine and below is their review on our retreat. The day will consist of introductions to many of the things that will be happening over the weekend. For individuals who are looking for a new way to balance the hectiness of modern life. You can be a complete beginner in Yoga and Meditation or you can practice regularly. This day will be a hand-holding Retreat to increase and explore your knowledge and allow you to sample many different techniques to keep you fit, healthy, calm and peaceful. The day will be adapted to suit your level as much as possible. Covering beginners and intermediate levels in Yoga and Meditation. You can have some knowledge of nutritional for health or none at all, you will all take something away from this day. 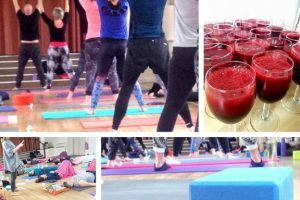 Whether you are looking for a day to just focus on yourself or want to manage life’s stressors or you are looking at improving your yoga practice or nutritional knowledge then we have all those boxes ticked. If you have any additional questions, please do not hesitate to get in touch. How many times have you ‘started’ your new eating plan only to last a few days before you fall back into your old habits. 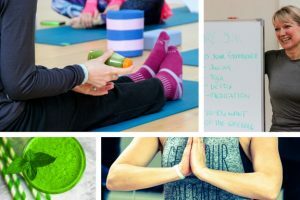 With our Yoga & Nourishment Retreat Days, we address the reasons why it is hard to stay on track, giving you the tools and motivation to take everything you have learnt home with you. Our goal is to empower you to take charge of your body and the direction you want in your life. We give you the tools to see how you can reach your goals and actually believing that they are achievable. We help you to reprogramme your mind as well as your body to a new way of thinking. The course is run by Lisa Barnes who has a wealth of knowledge professionally & personally in this field, thorough clinical experience and her own life’s journeys. Lisa’s experience comes from working in the natural health field of ‘Overwhelm’, seeing the need to take her clients off the ‘yo-yo’ dieting, addressing the mindsets behind this learnt behaviour and making it a long term lifestyle, rather than a quick fix. She uses her knowledge of Superfoods, nutrition & life coaching and has also explored Meditation and Energy healing during the last 7 years. The weekend was thoughtfully planned with a good balance of yoga, meditation, nutritional info and outdoor activities. Lisa was very supportive; Lisa provided expert knowledge of nutrition and calming meditation sessions and Mirella led us through some wonderful, yet sometimes challenging yoga sessions. They were very good at reading the group & individuals mood and tweaking bits here and there to fit with everybodies needs. I left feeling calm and invigorated at the end of the weekend with a bag full of Superfoods powders ready to begin the new me. I had many comments in the weeks ahead of how well I was looking – so all in all, good results! 7 hours to step away from the frenzied lives we lead to be given space, quiet, time to breath & nurture your inner self. I gained knowledge of nutrition, natural health tips, yoga & loved the company of the others who had made the wise decision to attend…..pure bliss. Lisa’s essence for this retreat is to bring a lot of love, laughter and joy to a fun packed, relaxing and get results based weekend. This will all take place within the beautiful City of Bath. If you are not local and are looking at staying in Bath for the weekend, we have a list of many local bed & breakfast or hotels nearby. Please contact us for further information.